The Downtown Rep has the great good fortune to have Pico House across the street from Union Station as a venue. The centuries-old building (still undergoing restoration) includes a gorgeous central courtyard of red brick--a seemingly perfect setting for a gothic work centered around this nation's most famous poet. They also play up this for all it is worth, exploring not only that wonderful courtyard but different rooms and hallways. Publicity calls it an "immersive" experience, which it certainly proves, and frankly more-than-usually successful. Part of the story's conceit centers around Poe, immediately following death, finding himself two choices embodied by two individuals from his life: Henry Kelly as a mysterious figure urging him to atone and repent for his errors; and Dan Lench as none other than Rufus Wilmot Griswold, the critic who loathed Poe and libeled him after death (portraying the poet as insane, seething with envy, a habitual drunk, etc.). They seek to show Poe his life, to understand himself as well as his work. Poe himself makes for a marvelously complex and weird individual, compelling and tragic yet strangely triumphant. His mother dying young, with a wealthy childless couple adopting Edgar (but not his siblings), his stepmother (Tiana Randall-Quant) dying young as well but an "odious" stepfather (Matt J.J. Miller) cutting him off in favor of his own illegitimate children. We follow and observe highlights of a difficult life, helped hardly at all by Poe's pride and sharp tongue. Yet without doubt he also proved a victim. The play doesn't really deal with this detail, but Poe was even murdered by parties unknown, almost certainly kept drunk for days to make sure he voted over and over again in Baltimore's local elections. Whoever they were, they left him in a gutter, in wet clothes in November. Along the way, he fell desperately in love and married his underage cousin Virginia (Chanel Castaneda) over her mother's (Kathleen Cecchin) objections. Yet by all account the marriage proved happy, until once again tuberculosis (called "consumption" at the time) slowly claimed her. Poe himself is played by several four different actors, allowing him to not only stand there in his life, but watch and comment upon it--his fierce and strange relationships with Mrs. Ellet (Rachel Levy), Mrs. Osgood (Arielle Uppaluri), and Helen Whitman (Dylan Diehl) among many others (these were but three of the many women in his life--a fact to which Virginia later makes her own loving but melancholy coda). Hence we have the dead or omniscient Poe (Devon Armstrong), my personal favorite Poe in his thirties (Garrick Lewinter), Poe a little younger (Alec Gaylord) and also in his teens (PJ Diaz). Within this limbo plays out not only scenes from Poe's life, but also his poems and his stories. Indeed, the very start of the play amounts to an adaptation of "The Cask of Amantillado" which increasingly seem cogent. The end result feels a little bit like one of Poe's stories, but ending with perhaps less horror and more wisdom, and a trifle more narrative complexity. The two hours of the show manages to leave us not with a lecture, but a dramatized portrait, a history in low key spectacle, leaving lessons or conclusions to be drawn by ourselves rather than imposed by the authors (Devon and John Armstrong). It really does come across in some sense as "a dream within a dream." 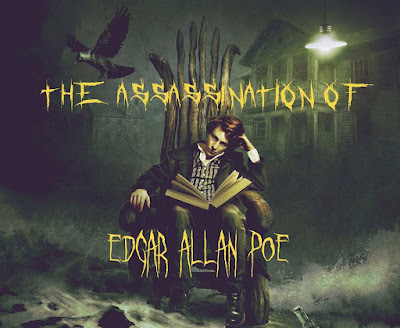 The Assassination of Edgar Allan Poe plays Fridays, Saturdays and Sundays at 7:15pm until August 26, 2018 at Pico House 424 North Main Street (at Olivera), Los Angeles CA 90012 (across the street from Union Station). Performances are free but contributions extremely welcome. Live theatre can do things nothing else can, not least bring to life dreams and myth. I believe it the ideal dramatic form for fantasy, far more than movies or television, no matter how much anyone spends on special effects. Longing Pinocchio shows exactly what I mean by that. Based not on the Disney sugar-coated version, but the original 1881 novel by Carlo Collodi, this play turns the story of the puppet who wants to be a real boy into more of an Odyssey in Dreams. Our framework is a funeral service of Gepetto the woodworker but re-imagined into contemporary times. Three actors--Valeria Iacompo (who plays the title character), Veronica Nolte, and playwright Eric Paterniani--play all the roles. Along the way, tiny costume changes and radical physical ones coupled with vivid characterizations help keep us very much aware of what's going on. 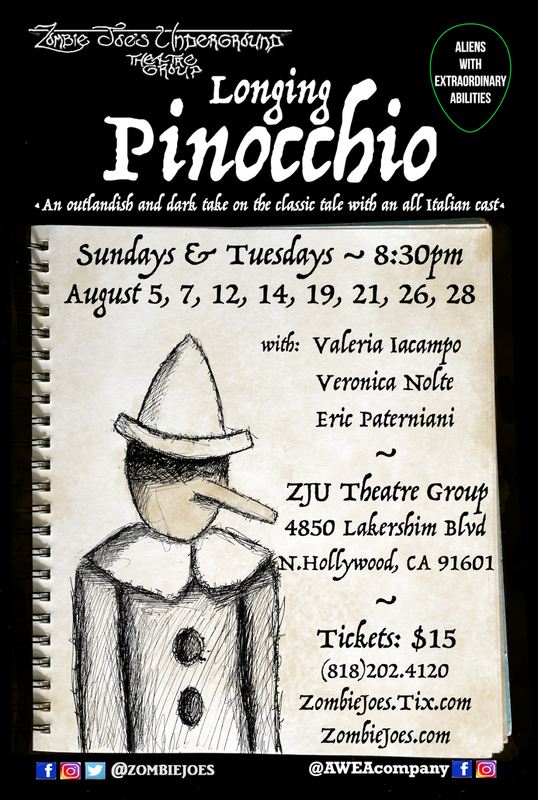 Increasingly, the chaotic and often terrifying adventures of Pinocchio become sheathed in shadows. Appropriate. For as much as this is an Odyssey of sorts, it is also a Divine Comedy. Not only a wild, magical world of talking animals, a turquoise fairie, and meetings inside monsters make up this tale. We also watch a journey through Purgatory, Hell and maybe even a glimpse of Heaven. At one point we pretty clearly see beyond death itself. Amidst all this come little speeches by those attending Gepetto's meager funeral, including his Nurse who so loved the wild stories the old man told about his child, some locals who try to use the occasion to sell life insurance, someone who used to lend him money, a ruffian who spied on the man but seemed to like him anyway. Not just comic relief (not always very comic), these serve as punctuation and reminders. It ends with an enigma that maybe serves also as an answer, a context with which to see this story, to understand how to feel about it all. Despite the warning above, I'm not going to spoil those details. But here is a bit of a clue--every single line means something, and when a line is repeated, it means much more. Plus, I must applaud the technical and dazzling skill of the cast, bringing to life so much on stage, often in sharp relief, often with very little time. The face of a real little boy turned into a beast of burden, a wise and good being of vast power and compassion, a terrified old man facing his end, a pair of casually cruel and skilled rascals, plus over a dozen more appeared and lived in that black box theatre that is Zombie Joe's. Most of all, the awkward and immature child trying to become whatever-it-is they will be. Together these three performers are called Aliens With Extraordinary Abilities, and personally I eagerly await anything they create in the future! 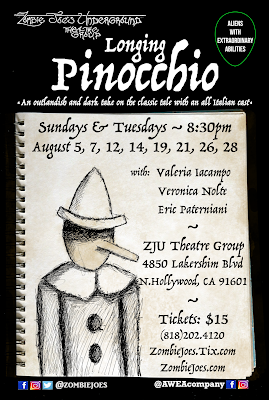 Longing Pinocchio plays Sundays and Tues at 8:30pm until August 28, 2018 at ZJU 4850 Lankershim Blvd (just south of the NoHo sign), North Hollywood CA 91601. This is a series of posts sharing my ideas/considerations while getting ready to adapt Bram Stoker's novel Dracula for the live stage. 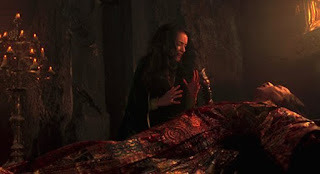 Mina lures Dracula to her bed, keeping him there until the sun rises, turning the Count into dust. Van Helsing and Seward finds Dracula's resting place and drive a stake into his heart. Or Van Helsing traces the vampire to his castle lair, and the two fight it out with weapons, until the Professor pulls away the curtains to flood the room with sunlight. Arthur Holmwood gets close enough to Dracula to drive a wooden stake into him, but dies in the process. Later, we see the aged, wizened vampire lurking in shadows, watching our heroes. Our heroes trap Dracula, using crosses to keep him out of his grave until the sun dissolves the vampire. But Mina quietly clutches her masters ring, the expression on her face sullen and secretive. After defeating all his foes, the great Count begs Mina to slay him, to end the centuries of hungry darkness. Weeping, she does so, then kills herself. This gives just a tiny example of the possibilities. In some cases, such as Hammer's famous series of movies, it came down to finding a new way to kill the vampire--falling backwards on a cross, drowning in running water, wrapped in the thorns of a hawthorn bush, even struck by lightning at one point! Which is cool and all, not wanting to put such invention down, but what I find more compelling is what the end signifies. Has the light vanquished darkness? Is Dracula destroyed, punished, or maybe set free at last? Are there any more vampires left? If so, who? And how do we find out about it? Or did Dracula fake his ending? Was the vampire killed even the "real" Dracula? Since the (presumed) defeat of the mysterious nobleman from Transylvania makes for the climax of the story, detail and nuance matter. Putting into those terms, a shadow of an image of how I want things to end comes to mind. Not a simple answer, no. Not an ending of horror or hope, but maybe both. We shall see. I will, anyway. Hopefully, so shall you.